Churg-Strauss syndrome refers to a systemic vasculitis involving small-sized arteries characterized by asthma, hypereosinophilia, and necrotizing vasculitis with extravascular eosinophil granulomas. This condition occurs usually in males in their fourth decade, who have a triad of rhinitis and asthma, eosinophilia and systemic vasculitis. The aetiology is uncertain, with some believing that it represents an unusual progression of allergic disease in a subset of predisposed individuals. Others believe it is a primary vasculitis which presents like asthma because of the involvement of eosinophils. The pathology of this condition is dominated by an eosinophilic infiltration with a characteristic high blood eosinophil count, vasculitis of small arteries and veins, and extravascular granulomas. Typically it involves the lungs, peripheral nerves and skin, but kidney involvement is uncommon. Transient patchy pneumonia-like shadows may occur, but sometimes these can be massive and bilateral. Skin lesions include tender subcutaneous nodules as well as petechial or purpuric lesions. ANCA is usually positive. The disease responds well to corticosteroids. Occasionally Churg-Strauss syndrome may be revealed when oral steroids are withdrawn in patients being treated for asthma. There is no reason to think that other anti-asthma drugs precipitate the condition. 1. The prodromal phase or allergic phase characterized by severe astina, either with or without allergic rhinitis, sinusites, headache, cough, and wheezing. 2. The eosinophilic phase characterized by peripheral eosinophilia and eosinophilic tissue infiltration producing signs and symptoms of cough, fever, anorexia, weight loss, sweats, malaise, abdominal pain, and diarrhea. 3. The vasculitic phase, which may involve any organ, including the heart (most frequent), lung, CNS, kidney, lymph nodes, muscle, and skin, and manifesting in chest pain, dyspnea, hemophysis, arthralgia, myalgias, peripheral neuropathy (mononeuritis multiplex), joint swelling, skin rash, and signs of CHF. • The cause of Churg-Strauss syndrome is unknown-a hypersensitivity immunological etiology has been proposed. 1. 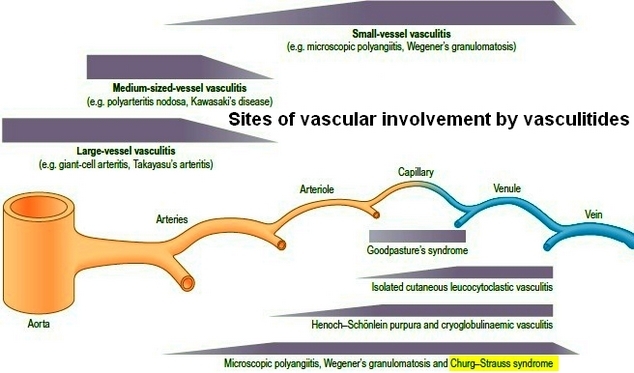 Churg-Strauss syndrome vasculitis involves not only small-sized arteries but also veins and venules. 2. Churg-Strauss syndrome, unlike PAN, predominantly involves the lung. Other organs affected include heart, GI, CNS, kidney, and skin. 3. Churg-Strauss biopsy show necrotizing vasculitis along with a granulomatous extravascular reaction infiltrated by eosinophils. The presence of any 4 or more of the 6 criteria yields a sensitivity of 85% and a specificity of 99%. If the clinical Suspicion of Churg-Strauss is raised, further workup including blood tests, x-rays, and tissue biopsy help establish the diagnosis. • CBC with differential may reveal one diagnostic criterion: eosinophilia with counts ranging from 5000 to 10,000 eosinophils/mm3. • ESR is usually elevated and a marker of inflammation. • BUN/creatinine may be elevated, suggesting renal involvement. • Urinalysis may show hematuria and proteinuria. • 24-hour urine for protein if greater than 1 g/day is a poor prognostic factor. • Antineutrophil cytoplasmic antibodies (ANCA), although not diagnostic of Churg-Strauss syndrome, are found in up to 73% of patients. • AST, ALT, and CPK may indicate liver or muscle (skeletal or cardiac) involvement. • RA and ANA may be positive. • Biopsy substantiates the diagnosis if the characteristic findings as described above are seen. • Chest x-ray is abnormal in >52% of the cases and can show patchy migratory infiltrates, interstitial lung disease, or nodular infiltrates. • Paranasal sinus films may reveal sinus opacification. • Angiography is sometimes done in patients with mesenteric ischemia or renal involvement. • Corticosteroids are the treatment of choice. Prednisone 1 mg/kg/day is the starting dose and is continued for the first month. Thereafter, prednisone is tapered progressively to 10 mg/day at 1 year. • A drop in the eosinophil count and the ESR documents a response. • Cyclophosphamide plus corticosteroids are used in patients with multiorgan involvement and poor prognostic factors. • Many with persistent symptoms of asthma will require long-term corticosteroids even if vasculitis is no longer present. • Clinical remissions are obtained in over 90% of patients. • With treatment, long-term prognosis is good, with a 5-years survival rate of 85%. • The 5-years survival of untreated Churg-Strauss is 28%. • Death usually occurs from progressive refractory vasculitis, myocardial involvement, or severe GI involvement (mesenteric ischemia, pancreatitis, etc. ).